Atlanta in 1866 was a city struggling to recover from the devastation of the Civil War. Sherman’s siege had laid waste to the city, demolished the all-important railroads, and crippled its ability to function. Smallpox had broken out among the 20,000 remaining citizens. So desperate was the town for money, the mayor appealed to Midwestern cities for credit to feed a starving population. In the midst of poverty and pessimism, local businessman Tom Burnett organized a baseball team, the Atlanta Baseball Club, to play a sport introduced to the South by Union troops during the Civil War. After only a few weeks of practice on a field next to Oakland Cemetery, Burnett declared his team “the finest team in the world,” ready to meet all challengers. The two teams met on May 12, 1866, on the field next to Oakland Cemetery. It was the first ever organized, professional game of baseball in the city of Atlanta. The citizenry came out in their finest to witness what was to that point the most anticipated sporting event in Atlanta history. The game started at 2:00 PM, with both teams marching onto the diamond to the music of a brass band. They played into the evening, with the final out being recorded at 6:30 PM. The Gate City Nine had achieved their goal, beating the tar out of the Atlanta Baseball Club by a score of…(wait for it)…127-29. The Atlanta Baseball Club did not play again following that day. The Gate City Nine went on to barnstorm the South for a couple of months, playing their last game on July 4, with a final record of 36-1. But professional baseball had taken hold in Atlanta. Moving ahead in fits and spurts over the next several years, it finally found its footing in 1901 with the Atlanta Crackers. The Crackers would go on to become the most successful team in Southern baseball for the next six decades. 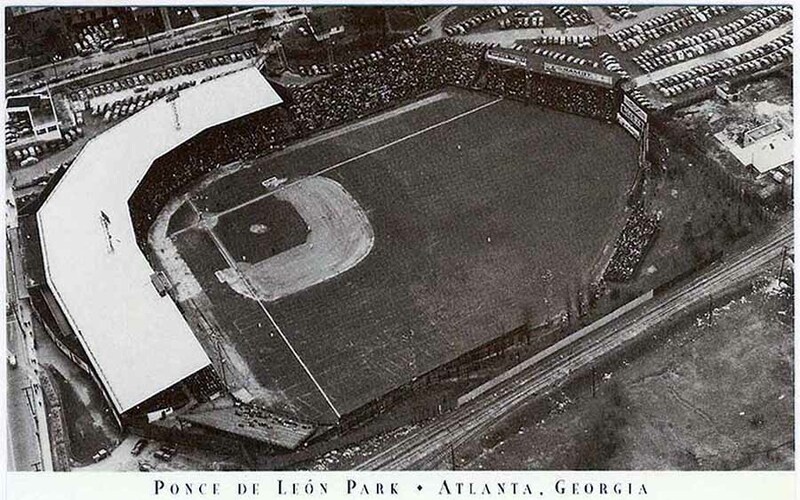 Ponce de Leon Park, home of the Atlanta Crackers and the Atlanta Black Crackers. Second only to Yankee Stadium in housing the most championship teams in its 58-year history. Atlanta took its place as a national city in the 1960s. The new jet terminal opened at Hartsfield Airport, Martin Luther King, Jr. led the civil rights movement, and Major League Baseball arrived when the Braves left Milwaukee to become the first major league franchise south of the Mason-Dixon line. Legendary Atlanta sports broadcaster Chuck Dowdle has said that Atlanta began its ascent as a national city with the arrival of the Braves. That ascent helped lay the foundation for the city to step on to the global stage by welcoming the world for the Centennial Olympic Games in 1996. Atlanta today stands a shining example of a modern, 21st century cosmopolitan metropolis. But it wasn’t always so. Just 150 years ago, the city was a burned out husk, struggling to survive and probably doomed to die. 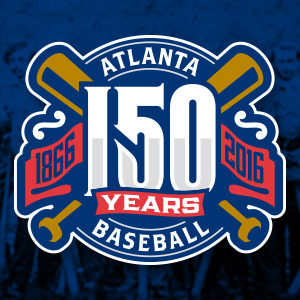 Today, on the 150th anniversary of the first professional baseball game in Atlanta, we are reminded that yes, sports matter. As a point of focus around which a community can rally, sports can function as an agent of change, a point of pride, and a means of bringing people together. While there are numerous stories and circumstances over the past 150 years pointing to the prosperity Atlanta enjoys today, the story of baseball stands out as unique. It’s one long, unbroken thread reaching back through a century and a half of history, weaving in and out of the fabric of our town. It reminds us that no matter how bad we may be beaten today, tomorrow is a new day, and how you get up is more important than how you got knocked down. Root, root, root for the home team, Atlanta. Here’s to the next 150. For more information about the history of baseball in Atlanta, read Tim Darnell's excellent book, The Crackers: Early Days of Atlanta Baseball.